This blush blazer was a total impulse H&M purchase and turned out to be $35 well spent....unlike that sequins jacket I bought on sale a few years ago (that's a story for another day). The structure and color made it an easy to dress up dresses during the spring and summer and I'm happy to bring it into fall since pink is right on trend this fall. Unfortunately, H&M no longer carries it in pink (online) it does carry it in light beige, black, and natural white. You can check out how I wore it in black here. Wear blush with warmer tones in the fall. Think cream, brown and cognac. Wear an over sized blazer with jeans, boots and an oversized scarf to make a casual outfit a bit more polished. 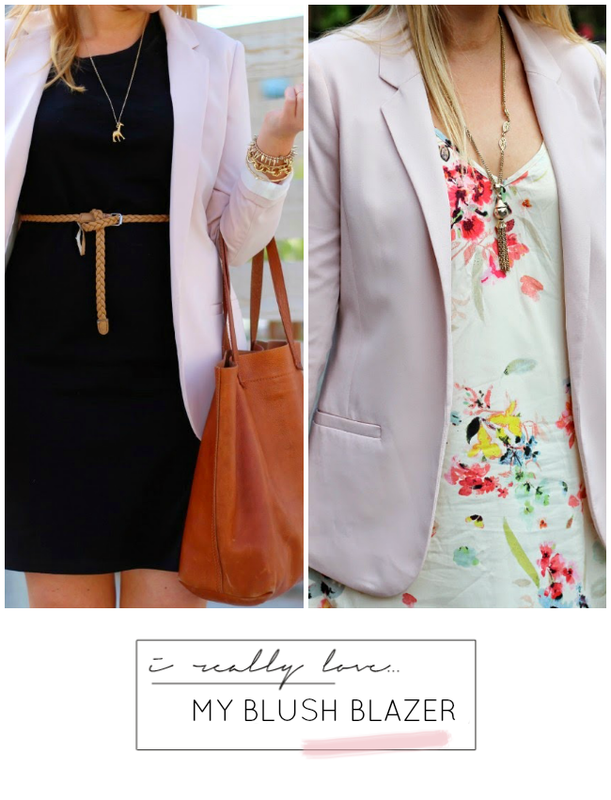 Shop other blush blazer options below! LOVE the unexpected color of this blazer. Looks great on you!